Well, there’s no help for the latter at the moment, despite the USB-C port on the latest model, but there is a viable and completely free alternative for playing a variety of media types over the network: VLC, or the VideoLan Player. VLC is well known throughout the computing universe. On Windows, it’s just one of several options for playing variegated file types. On the Mac and Linux, the best of very few. On Apple TV it’s a welcome addition that obviates the need to pony up cash for anything on the rather abbreviated list of flawed products (Playable, OnePlayer, 8 Player, etc.) and Plex, which requires an account. 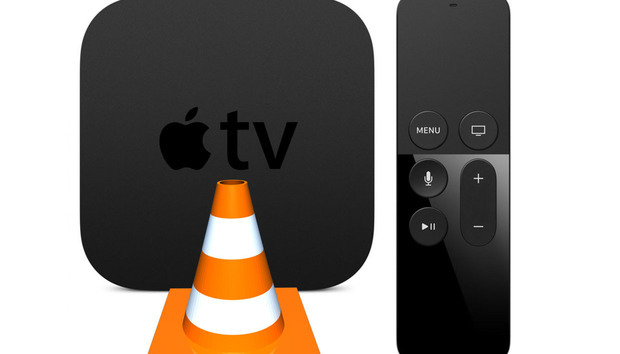 Is VLC for Apple TV (called VLC for Mobile in the App store) perfect? No. Does it work? Yes. Quite well. At least with audio and video. In my hands-on, it didn’t want to display image files, though it did list them and create thumbnails. I’m thinking that’s a bug and expect that it will soon be fixed. Audio support was nothing short of fantastic. In addition to the usual M4A, MP3, and WAV support, VLC also played both Apple Lossless and WMA Lossless, APE, FLAC, OGG, and even Opus. It also played 5.1- and 7.1-channel surround sound. Wow. Video support was almost as good. VLC for Apple TV understands HEVC and UHD (3840 by 2160, or 2160p), but successful playback was limited to 1080 and frames per second to 30 for reasons undetermined. When working within those limitations, VLC handled MP4, WMV, FLV, OGG, QuickTime, and just about everything else; even some old Real Media formats. That’s not surprising as all the versions of VLC use internal codecs for just about everything. The one notable fail was MKV files—one 500MB, the other 30GB. Either it took too long to cache, or there was another issue. But even MKV played fine when I streamed it to VLC using DLNA. My NAS boxes offer DLNA, and so does Windows Media Player. Files from WMP weren’t enumerated perfectly right off the bat, but that might just as easily been WMP as VLC. 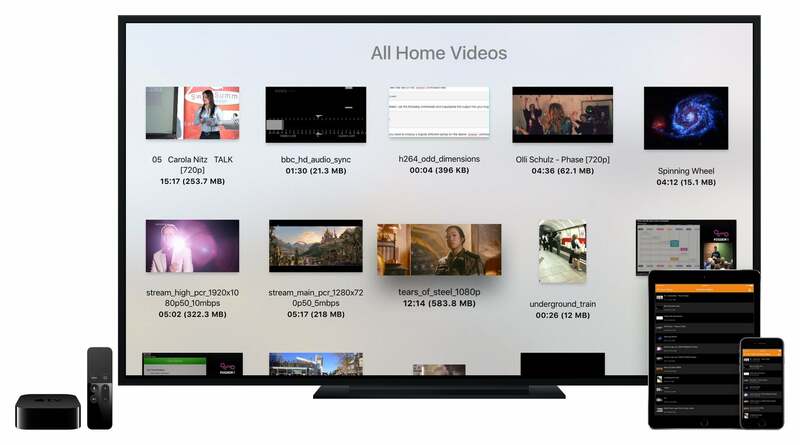 Thanks to VLC, Apple TV now supports nearly every audio and video file format you can find. For free. And from any network device. On Apple TV, VLC comes closer to acting as its name implies than on any other system. Rather than simply presenting you with a player, then forcing you through arcane menus to retrieve media from a network resource, it immediately pops up with the local network resources. Cool. In my case, that’s several PCs and Macs, plus three NAS boxes. Yes, I have a lot of stuff. VLC understands the SMB (Server Message Block) networking protocol used by Windows, AFP (Apple File Protocol), and the aforementioned DLNA (Digital Living Network Alliance) media-streaming standard, so any device using those (in other words, just about everything in the universe) will show up. This is all done independently from Apple Home Sharing, which is limited to iTunes instances with it enabled. VLC can also play files stored locally on the Apple TV box. Okay, the capabilities are there, and VLC works pretty darn well. It still suffers some of the same minor issues it does on other platforms. First off, I wouldn’t exactly call it ugly, but it’s certainly not the prettiest child in the Apple app family. It also had the image display bug I mentioned earlier, and didn’t always fail politely on a bad or unknown file. It never hung the unit, as some other players I’ve tested have, but it would be nice to receive notification that it didn’t understand a file rather than the impolitic skip to the next file you do get. I also had some issues with it not re-selecting the proper folder in the list; i.e., the one I just exited from. None of those annoyances matter much when all of a sudden your Apple TV box can play virtually any file from any of your devices without any cash outlay on your part. That’s a nice upgrade right there. In fact, Apple ought to thank the VLC folks for so drastically expanding the capabilities of its box. Since it probably won't: Thanks VLC folks!